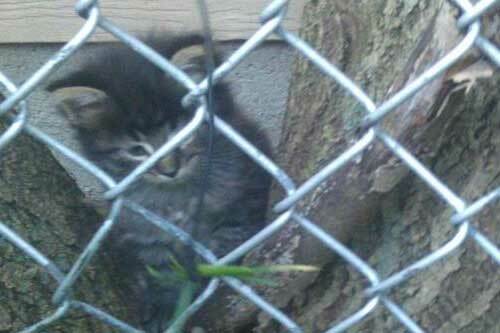 Remember when I posted about the kittens in our backyard? Well, I guess the mama cat got a little worried about someone’s constant checking up on them…I mean how are you suppose to keep a 6 year old cat lover away from this adorableness? It’s impossible! So mama cat packed up her babies and headed for the hills. First, she moved them under our neighbors deck but she quickly figured out that we weren’t that easy to fool so she moved them again and we hadn’t seen them for a few day…until yesterday! I spotted them a couple of yards down where there is apparently a feral cat haven. Sigh! Well, just when we were ready to throw our hands up and say there’s nothing we can do now we got a knock at our door. It’s kinda cool to have a house where that sort of thing is possible~a knock at the door. It was our first visitor and it turned out to be a cat angel! A woman from Treehouse was going door to door to discuss the feral cat issue and to reach out for help. We were so excited to talk to her, she had some really good news for us. I think she was excited to talk with us as well since we had already started looking for homes for them and found a couple of people willing to “consider” taking a kitten. So I wanted to give a little shout out to Treehouse and pass on the news of how they work with the feral cat issue. Before she showed up I knew about the TNR program. TNR stands for Trap Neuter Release, it’s something people who care for feral cats can do to manage the feral cat population and keep it from growing. I don’t know about the cost of this program. I think they ask for a donation. I believe you can also do this through the Anti-Cruelty Society and their site lists that they offer free spaying or neutering of feral cats. I believe that Treehouse can provide you with a cage to trap the cats, so that makes things a little easier. You trap them and bring them in and they spay and neuter them. Easy peasy! This then, prevents the multiplying of alley cats. I don’t know if anyone remembers the recent study that said outdoor cats kill way more wildlife then previously suspected. Anyway, she also mentioned other very low costs options for cat care when taking in feral cats. I don’t want to misquote anyone so I’ll leave it to you to call Treehouse to confirm what options are available if you want to keep a kitten or just maintain a feral cat colony.